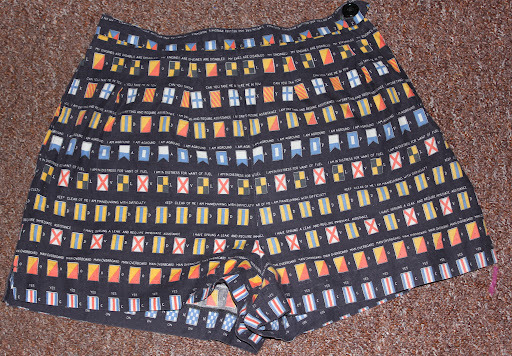 So, The latest acquisition to my vintage collection is this COMPLETELY crazy novelty print skirt. O.k. so it is a bit immature, but that kind of makes me love it more. My Sportaville shorts. These provide a great talking point when drunk as they are covered in shipping signals. I always find it hilarious to read my shorts to people. The best one to say when drunk though has to be “I have sprung a leak and require immediate assistance”. Ho ho ho. What i find even MORE intriguing is that they seem to have been using some of the same fabrics as Blanes. 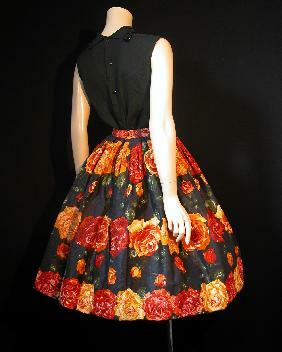 This skirt sold by tasty vintage features the IDENTICAL print to a Blanes dress from my collection. The description of the fabric suggests that even this was the same. Now, the question is, where the two companies related, or as i think is more likely did one copy the others prints? So, do you know anything more about Sportaville? 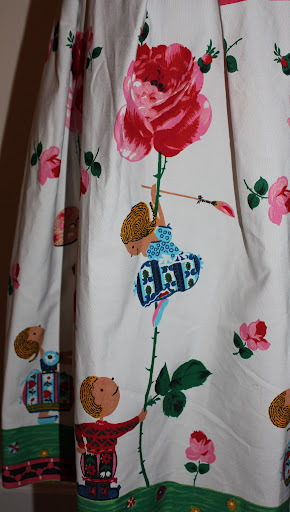 If so please do get in contact, I am totally fascinated by the brand and would love a bit more information about who was designing these fabulous prints. « Summer means Summer dresses! Hi I have a Sprtaville skirt that was my my mums, her dancing skirt she said, worn with masses of tulle underskirts and of to the the Lyceam in London to dance the night away,, actually looks great with a tight black top.It is Gold with a emblem type pattern (motif) and very simlar to the shape of your Rose skirt. 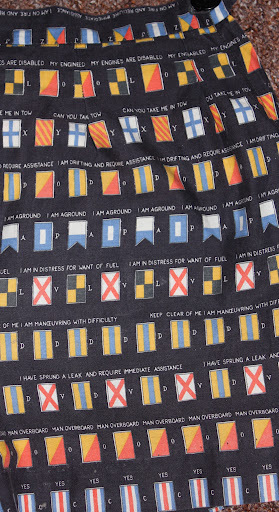 I have a skirt which has a faded label making it difficult to trace, it does however have font in italic writing and 'made in London' printed. Any ideas? 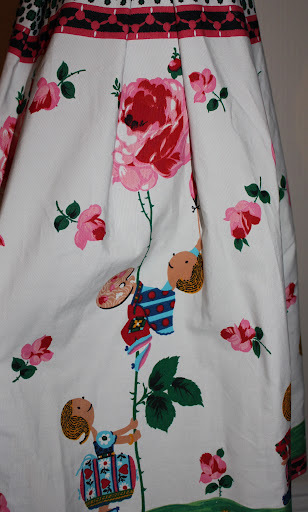 I've just discovered that a skirt I bought some months back is a Sportaville creation, and like yours, has the brand name stitched onto a piece of fabric at the bottom of the hem on the inside. It says 'Rose Border' by Sportaville'. Unfortunately the tag had worn thin when I made the purchase and I've been trying to trace the LONDON. W.1 that is still visible on the label.If anyone knows anything more about this particular collection in Sportaville I'd be interested to learn more. Hi Liz, I like that penny farthing print. 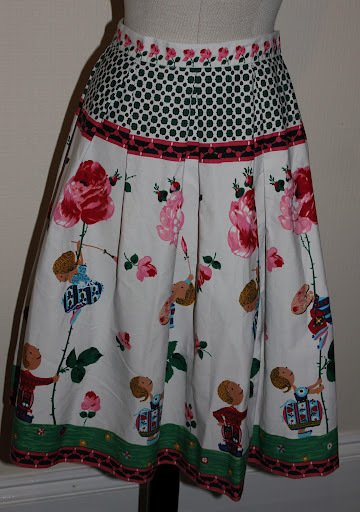 I recently investigated Sportaville when I added a Sportaville 1950s red corduroy circle skirt to my shop. I discovered the label can be dated back to 1946 as a small Sportaville ad ran in the book 'Palestine's Economic Future: A Review of Progress and Prospects' of that year. Interested to read your comments, I represented Saville Sportswear in Export Markets for some years The ‘Sportaville’ range was then designed by Arthur Saville (and his son?) and they closed sometime in the 80’s. I still have a few samples from the range. Paddi. I’m trying to remember you without any luck. All the other peoples names you mention are correct what a memory. My mother kept a fashion shop from the early fifties until the seventies and stocked Sportaville. would always send her bottles of Chanel No 5 and silk scarves at Christmas. Hi this was my Fathers Company. Sportavill or Saville Sportswear was closed down after all creditors were paid off. W1. It then moved to 28 Briuton Street, where the Fashion Show took place. Eventually it moved to 19/20 Great Portland Street this was in the Seventies.